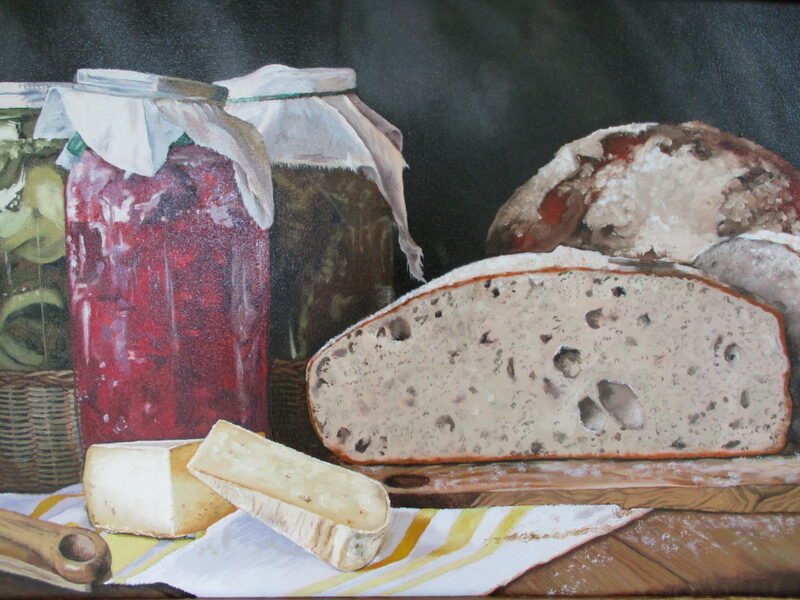 In March 2019, artist Kate Wood completed this still life painting of food sold at Ground Floor Farm in Stuart, FL. She titled the painting Morning at the Farm. 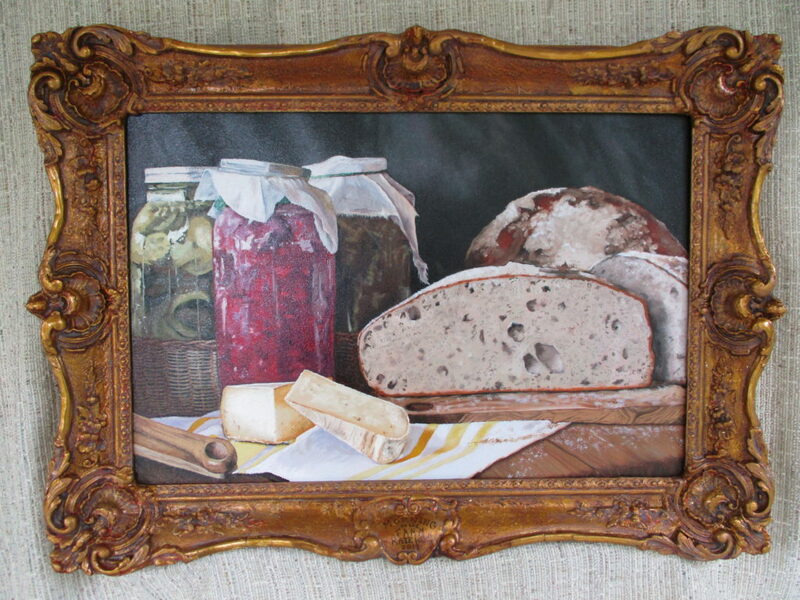 After completing the 16 x 24-inch oil painting, Kate Wood had it professionally framed. The antique frame was first restored by Kate through her restoration business: Alchemy Fine Art Restorers. The price to purchase Morning at the Farm is $1200. Ground Floor Farm is an urban farm, restaurant, and local goods market in Stuart, Florida. Their aim is to help grow a more dynamic town through food, art, and fun. They nourish Stuart with excellent food, interesting workshops, and enriching cultural and artistic experiences. In fact, Morning at the Farm revisits a theme Kate first introduced when she joined her husband, Greg Leatherman, to take part in a 2017 mural project at Ground Floor Farm. That project brought together several talented artists to help beautify downtown Stuart. Other murals created by Kate Wood are visible throughought Stuart, including on the 555 Building at the corner of Colorado and 6th Street. You can see a selection of Kate Wood’s art by visiting Alizarin Crimson Art Studio located at 2611 SE Ocean Blvd/ Cedar Point Plaza in Stuart. Kate teaches oil painting at Alizarin Crimson. To see the related mural (and other murals by local artists), visit Ground Floor Farm, located in the heart of Stuart at 100 SE Martin Luther King Blvd, just off Colorado Avenue.